You know how some hikes can be kinda boring, then have a big reward like an outstanding overlook at the end? Or perhaps others will wind through a stunning forest only to peter out? 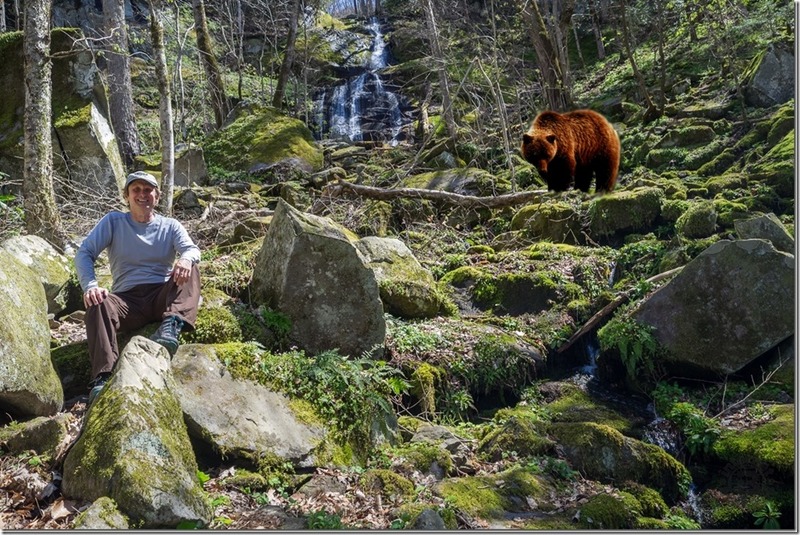 Well, this hike located in the Greenbrier section of the Smokies has neither problem. The Porters Creek Trail is an exciting adventure from start to finish. I would describe it as a play with four acts. The opening act follows a picturesque, cascading mountain stream. Act II is all about history — including farmsteads, a cemetery, and recreations of a 19th century barn and cabin. You enter a world of magnificent wildflowers and old growth forest in the third act, with it all leading to a resounding crescendo in the final act at splendid Fern Branch Falls. By the time you finish, you’ll be ready for an encore. I completely enjoyed my time there on Tuesday, March 31, 2015 from 10:45AM to 2:00PM. My plan was to take the Porters Creek Trail to Fern Branch Falls, with a stop at the restored historic structures along the way, returning via the same path. Hike Rating: Easy first half, moderate after that. Never excessively strenuous. Trail Condition: Mostly very good. Gravel roadway first half. Rocky single track trail after that with two footlog creek crossings. Rock scramble at Fern Branch Falls. Starting Point: Trailhead at the end of Greenbrier Road. Trail Traffic: Extremely popular and busy trail in Spring. There were at least a hundred hikers and tourists on the trail on this mid-week last day of March. How to Get There: From NC take exit 443 on I-40. Cross the Foothills Parkway and turn left on Hwy 321. Go 13.5 miles and turn left on Greenbrier Road. This road will change to gravel after a short distance. Drive a little more than four miles to the dead end of Greenbrier Road. The trailhead is behind the gate. There is parking for about 20 cars, so get there early or you will have to walk extra distance up the road. From Gatlinburg, TN travel east on Hwy 321 six miles and turn right onto Greenbrier Road. I’ve heard for quite some time now that the Porters Creek Trail in the Greenbrier section of the Smokies is a haven for wildflowers. What I didn’t know is that it is so much more than that. This is a great place for your entire family. The trail is easy enough that the toddlers and the doddlers will feel equally comfortable. If cold running mountain creeks are your thing… check. Love the Smokies for its historical significance? Check. How about an exciting waterfall to cap off your trek? Check. And don’t forget the wildflowers. Oh, the wildflowers! If you can call it a down side, Porters Creek is hugely popular for all the reasons mentioned above. Plus, it’s super convenient; a mere 10 miles from Gatlinburg. So you best get there early if you want to find a place to park within a half mile of the trailhead, even on a weekday. I got there at 10:30 and the prime parking was already full. I would suggest 9:00, or earlier. For the first mile, Porters Creek Trail is a gravel road. Good thing too. During my visit I encountered two different group outings of at least 15 people. The wide pathway enables groups to stay together. This old road follows Porters Creek with a gentle upward grade, and for the first half mile the stream is easily accessible. There are dozens of places to sit on the boulders that fill the creek and dip your toes. Look for a variety of ferns and moss that love being near the water. If you’re patient and quiet, you might even see a salamander. The topography of Great Smoky Mountains National Park consists of moderately sharp-crested, steep-sided ridges separated by deep V-shaped valleys. Many of the mountain ridges branch and subdivide creating a complex of drainage systems with many fast-flowing clear mountain streams. The park contains 22 major watersheds and the water table is near the surface in almost all sections. 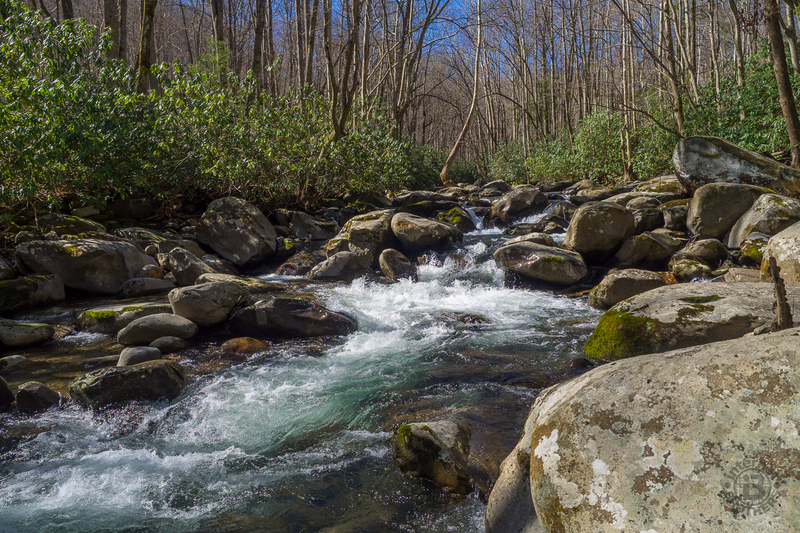 When you think of the Smokies, think water, like Porters Creek. At the half mile mark, change your gaze from the creek on your left to the moss-covered stone boundary walls on your right. This is the old farmstead of Elbert Cantrell who settled here along Porters Creek a hundred years ago. You’ll pass old stone steps that lead to the former house site. The area covers several acres, so you could spend quite some time just studying the remnants here. As you continue up trail, other house sites and stone boundary walls are in evidence. You will cross Long Branch on a footbridge at the three quarter mile mark. Watch for another small set of block stairs to your right that lead to Ownby Cemetery. This century-old small family plot houses perhaps two dozen grave markers that are still decorated to this day by modern day relatives. The gravel road ends at the one mile point. There is a fork here with a gorgeous eastern hemlock grove in the center of the split. Take the right pathway for a look back in time at the life lived by the Smoky Mountain settlers of the late 19th century. It is roughly 250 yards to the restored John Messer barn, originally constructed by Pinkney Whaley in 1875. The Whaley family migrated from North Carolina in the early 1800s and founded the fertile, secluded Greenbrier valley. The Whaleys later sold their farm to John Messer, who was married to Pinkney’s cousin, Lucy. 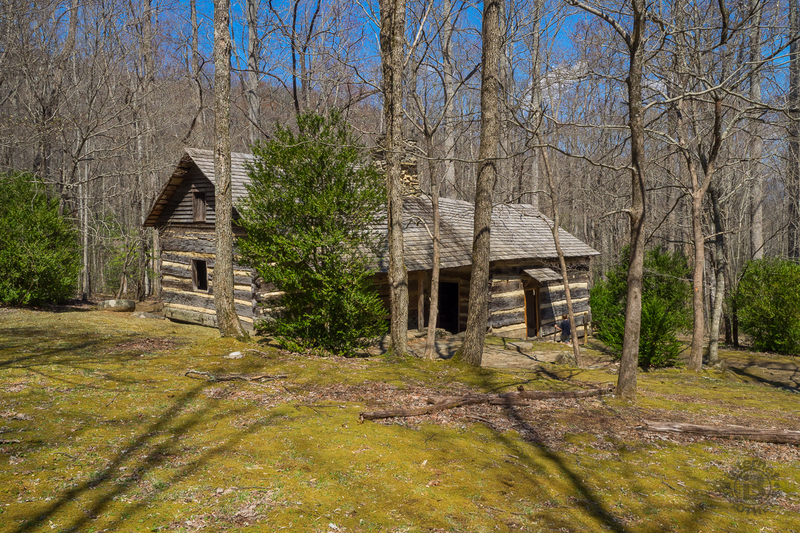 In the 1930s, the Smoky Mountain Hiking Club constructed this nearby cabin and leased the barn from the NPS. The barn was added to the National Register of Historic Places in 1976, and is the last surviving structure from the pre-park Greenbrier Cove community. Don’t stop at the barn. Continue down the trail to the old spring house and the beautifully restored cabin. Walk around in the cabin to get a feel for the cramped quarters. Whole families lived in spaces that aren’t much larger than studio apartments of today. If you peek out back you will even notice the trail continuing to the outhouse, located in the woods a hundred feet away. Returning to the trail junction, get back on the left fork. A short hundred feet later you will reach another junction… this one with the Brushy Mountain Trail. For those who have an interest, Brushy Mountain is one of the many ways of summiting the iconic Mt. LeConte. For this hike, however, continue to the left on the Porters Creek Trail. You will be on single track dirt trail now for the remainder of your journey. And old growth forest. The trees get much larger now, and the pathway seems like a narrow chute compared to the roadway before. You’re quite a bit higher than Porters Creek here. If you peer over the side, look for Fraser magnolia and hemlock. Look too for the first scattering of wildflowers. There is painted trillium here, and the occasional dwarf iris. But the best of the wildflowers is yet to come. A half mile after the trail junction you will once again be at the same level as Porters Creek and reach a footlog crossing that is a marvel of trail engineering. Constructed with concrete piers for support, with a 60° angle about two-thirds across, this bridge may be a bit intimidating, but it is an excellent opportunity for photos of the creek. Once on the other side, though, you enter a world of utter enchantment. Just past the footlog look on your right along a bank with moss-covered logs and stones. 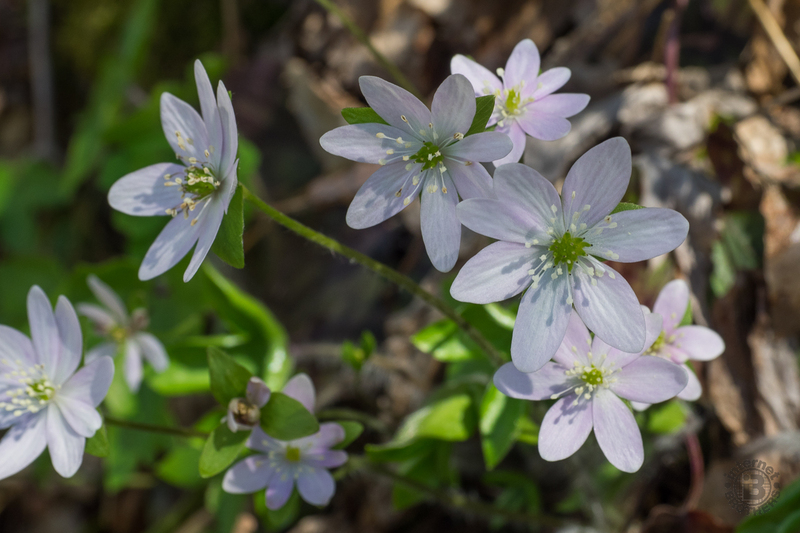 Embedded within are micro-gardens of hepatica, the rare and elusive Dutchman’s breeches, fringed phacelia, trilliums, bloodroot and violets. As you continue along the trail, take your time and study the ground on either side of the pathway, because you are likely to encounter trout lilies, wild geranium, may apple, phlox, bluets… even jack-in-the-pulpit. It’s a luxuriance of blossoms. The trail makes a hairpin turn to the right, climbs a small hill and enters an even more remarkable floral region known as Porters Flat. This moist, sheltered cove is carpeted with flowers and filled with giant yellow buckeye trees. In early to mid-April the wealth of phacelia makes it look like a new snowfall. This Nature’s garden is filled with a variety of trillium, with toothwort, foamflower, blue cohosh and bishop’s cap. It is said there are as many as 40 different varieties of wildflowers that populate Porters Flat. The trail begins to climb gradually above the flat, on a rocky ledge. It’s time to watch your step now as exposed roots and rocks make somewhat of a tripping hazard. On your left, the boulders and outcrops get larger as do the trees. Porters Creek is on your right now, and as you continue to climb, farther and farther below. You can see the whitewater as it tumbles through the cove forest. Fern Branch Falls will be high on the hill to your left, approximately two miles from the trailhead. It seems distant at first, with a large mossy boulder field between you and the splash point. This multi-tiered slide waterfall is about 40 feet total height. Wild ginger and brook lettuce grows here on the creek bank below the falls. There is a pathway that winds through the boulders on the left that enables a closer view. About half way up the boulder field there is a very large log that makes an excellent spot for pictures and lunch. The creek flows beneath the moss and lichen encrusted rocks below you, with a fresh scent and a soothing sound. I even had about 10 minutes of solitude without another soul around. Seemed like a great opportunity for a selfie. After renourishing, I climbed even higher to get a closer look at Fern Branch Falls. Somewhat surprisingly with recent rain, it didn’t seem to have a significant flow. I suspect this would be an even more dramatic spot following a big storm, but the boulder field would be a lot more treacherous to navigate. Regardless, it is quite picturesque. A large group of happy, playful youngsters arrived and that signaled an end to the serenity. You can continue beyond Fern Branch Falls on the Porters Creek Trail to a backcountry campsite 1.7 miles farther, but I was fulfilled. The return trip is simply back the way you came. By now, there were even more wildflower blooms popping out in the brilliant afternoon sunshine, to go with an even larger crowd of touristy types padding along the trail in their flip flops and Raybans. I felt blessed to have received that 10 minutes of alone time at the waterfall. It’s as if the National Park Service had ordered the sensational azure sky. I haven’t yet seen Porters Creek during green season to know what the tree canopy is like, but it was stunning on this last day of March with the leaves down. It enabled the blue to enrich the surrounding mountains. I took my time on the way back down the trail, chatting with other hikers, feeling the warmth and glow of the sun, splashing my face with the cool, crisp wetness of Porters Creek. Best Hike In summary, I have to say the Porters Creek Trail is everything I’d heard it to be, and more. The wildflowers were glorious, as advertised. Fern Branch Falls looked even more rugged than the pictures I had seen. What I wasn’t aware of was all the history. The restoration work is extremely well done; a throwback to the turn of 20th century living. For me, Porters Creek Trail is one of the best hikes in the Smokies. Bring your whole family and spend the day. There are plenty of other trails in the Greenbrier area as well, including Ramsey Cascades and the Grandfather Tree. It’s Smoky Mountain Nirvana. Hat tip to the lovely and talented Jann for the enhanced selfie photo! Updated November 5, 2018: I’ve made several visits to Porters Creek during spring, but never made it to experience the leaf peeping season… until now. It’s fair to say the scenery is nearly as spectacular. The Ferns Branch Falls amphitheater is surrounded by brilliant yellows, golds and ambers. Canopies of fall color hang over Porters Creek, and the forest surrounding the Messer barn and hiker’s clubhouse is alight with the hues of the season. See for yourself.